College was a time for sleeping on futons and mattresses right on the floor but there comes a time when we must leave these things in the past. A great night of sleep has been well-documented to increase your overall mood but did you know it can also aid in your personal weight loss journey? The CBC has even gone as far as labeling the lack of sleep as an 'epidemic' stating that most individuals (around 60%) feel like they wake up tired, have just 6.9 hours of sleep, and 30% having even less than six each night. This lack of sleep naturally leads to the irritability, low energy levels, and as per our topic: weight gain. Each build upon one another creating an unstable mix for those trying to watch their figure. However, a common factor mixed in with it all is the fact that many (if not most) people have a rather uncomfortable mattress. They may have a traditional boxspring mattress found at big box retailers which do not conform to their needs nor provide the comfort you'd find in memory foam mattresses such as those offered directly through our website. But let's get back on topic. Let's consider what a proper mattress can do in terms of weight loss now that we know it can be a factor. Our bodies are governed by a biological clock. Some are wired to be morning people and others take on the moniker of a night owl. These cycles slightly depend on each individual but for your average individual, l it comes in waves between 70/90 - 100/120 minutes. To suddenly wake up during a deep REM stage will result in tiredness. What could cause something like that? Oh, an uncomfortable mattress! 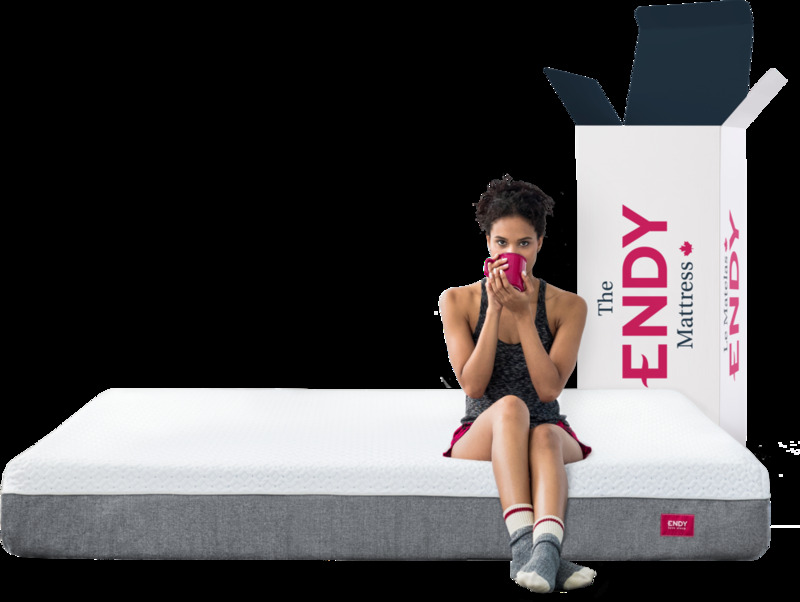 The Endy mattress uses a combination of memory foam, high-density foam (for support), and a firm foam base which creates a high-level of comfort thus resulting in less restless tossing and turning throughout the night. Studies have also shown that a well-rested body burns 20% more calories after a meal versus when being sleep-deprived! The mood swings you are likely to experience from lack of sleep can lead to poor decision making abilities and an overall "slump" in your daily activities. Depression, as noted, is one of the factors that go toward the all-too-common insomnia people experience. You are also likely to snack for comfort or avoid activities which, in turn, adds to the effect because now you may begin stressing that you're not experiencing an active lifestyle. They say breakfast is the most important meal of the day but how many times have you woken up so groggy and tired that the only thing you had time for was a cup of coffee and a quick shower before heading out the door? Better sleep will ensure you have the energy to start the day strong but also introduces a few benefits when it comes to your appetite. Focus - A well-rested body creates a well-rested brain. You will find an increase in focus after a good night of rest. You are more likely to tackle difficult objectives throughout your work day and afternoon activities whether that's working extra hours, exercising, socializing, and more. You are likely to also have well-balanced meals because you're now focused on the activity. Portion Control - A Swedish study found that sleep-deprevation often causes you to choose larger portions. Obviously larger portions means more calories which isn't going to help with your diet and routine. Better Choices - As along with focus will come a boost in your reasoning and logical decision making. Know where that comes into play? When you're shopping for food or considering grabbing something on the go versus feeling "tired" and don't want to cook for the night. Less Snacking - Uncomfortable mattresses will keep you tossing and turning until you hit a sweet spot. The mattresses and pillows we offer will help you doze off the moment you throw over the covers. Because you're falling into your slumber in rapid fashion you're now less likely to hop back up to grab a late-night snack. It's all rather interesting how our diet is affected by our sleep. The body and mind now feel the proper energy it craves versus craving for foods and beverages to balance out. People tend to choose a mattress from the big box retailers because they're within a decent location and pricing. However, these mattresses are mass produced to the point that they use materials just enough to pass the grade. When you consider you spend nearly 1/3rd of your life sleeping and how many choose to replace their mattress, perhaps, once a decade it boggles the mind why they wouldn't choose comfort. What makes the Endy Sleep so amazing is not just the high quality material but also flexibility for those ready to change their sleep routine (and subsequent weight loss as a result). A great night of sleep: check. The energy to tackle the day: check. Better choices with your diet: check. Comfort for those intimate moments: check. You deserve the good sleep and the added bonus of burning off a little more each day until you've hit your goals.